Pens are definitely what is hot right now, and quite a few manufacturers are getting into the pen game. One that we had been looking forward to was Columbia River because we figured that they would collaborate with someone really cool to make their pen. We were right… they have just released a pen designed by Allen Elishewitz! This is a beautiful and comfortable writing implement that is also a self-defense tool designed to be used at multiple levels of threat and response. This Solingen, Germany made hunting knife is truly a piece of art. The shape is not only elegant, but quite functional and comfortable. The beech wood handles are beautiful and individual. The CPM S35VN steel is designed for high performance edge retention. The designer is Neil Blackwood, who is usually only available in the custom market. This is a knife worth the investment. Boker occasionally offers these great “Off the Wall” Specials… basically they take their great Solingen, Germany made traditional folders and build them with different handle materials that they have small batches off. Because they have everything already there on the shelf, they can produce them at a great price… which they pass along to us… which we have passed along to you. 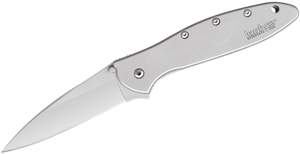 The Calypso, one of Spyderco’s most sought after knives, was designed as a working knife that felt natural in the user’s hand. The Caly 3.5 is the newest generation of Calypso, and is larger than the previous generation, the Caly 3. There are numerous reasons for the Calypso’s popularity. The thick leaf shaped blade and flat ground edge create a strong and precise edge, allowing for complicated cuts but capable of powerful cuts. More importantly, the design of the handle and blade create a natural holding position that gives the user incredible control over the knife. Because the index finger and thumb press against the metal of the blade while holding the knife, it feels less like a foreign object, and more like an extension of your hand, allowing a more intuitive understanding of where every part of the blade’s edge is at any given time. All of this is brought together with Japanese manufacturing, a high quality VG-10 steel blade, and G-10 handles, to create an excellent knife that would be the pride of any collection. Gil Hibben’s Karate Master is Back! 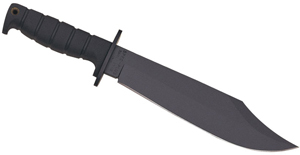 Gil Hibben is a knife maker well known for designing the knives used in Rambo III and Rambo IV. However, one of his first major contributions to the knife world was the Kenpo knife, a knife now used in the Kenpo long form VIII. A handmade version of this knife was given to both Ed Parker and Elvis Presley, fellow practitioners of Kenpo. The Karate Master is a classic reproduction of the Kenpo knife by United Cutlery which is being brought back due to popularity. The shape and weight of the blade allow for excellent penetration, and the slant of the hilt allows it to be held with the thumb on pressed against the hilt. This method of holding the knife is much more stable and powerful than the common method, which results in the thumb pointing down. The clever folks at Havalon are at it again. First they changed the hunting world forever with their introduction of the Piranta series of replaceable blade skinning knives. Now they have done the same thing for the fishing world with the Baracuta series of replaceable blade fillet knives. If you want to catch and clean fish all day without ever having to stop and sharpen, then this is the ideal fillet knife for you! This light is over the top. It looks odd, kinda like a three headed monster, but it allows so much more functionality as well as improved heat dispersion. The three heads allow for three levels of output, from 8 lumens to 760 lumens, with runtimes from 232 hours down to 2 hours accordingly. There are also 3 strobe modes available. All of this in a waterproof light that runs on standard AA batteries. How cool is that? Bob Lum made beautiful knife designs. 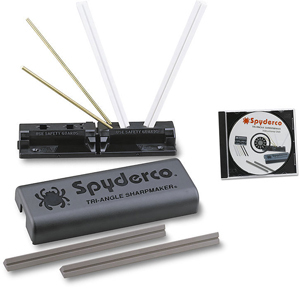 After his death in 2007, Spyderco has kept those designs going with several short run variations on his original C65 design. The latest, limited edition variation to emerge is the titanium handled model. This is one of the first Lum designs and, for fans of the leaf shaped blade, matching it with titanium handles makes it a classic. The kukri is a very popular fixed blade knife, the shape of which has frequently been adapted to machetes, but it is rarely seen on a folder. In fact, the only other folding kukris we currently carry are Cold Steel’s Rajah II and Rajah III. Hailing from Nepal and India, the primary feature of the kukri is the heavy recurve, which results in the blade being much thicker at the tip. For traditional kukris, this makes them much more capable for chopping tasks. The folding kukri is not nearly as good for chopping large pieces of wood, but the shape still makes it great for other tasks. The recurve creates a dip in the knife that prevents the item that is being cut from slipping away from the knife, making it easier to cut wet rope or fish. It also creates a longer usable edge than other blades of similar length. Although there is no thumbstud or hole, the nail nick creates more than enough friction for opening the knife one handed. Boker’s new Magnum Pocket Kukri has one big advantage over the Rajah series: It is a fraction of the price. At $17.95, you have the perfect excuse to indulge your curiosity and check out this knife. Santa Fe Stoneworks Knife with Dinosaur Bone Handles, Own a Piece of History! It is amazing what you can get on a knife handle these days. The skilled artisans at Santa Fe Stoneworks have released a beautiful lockback with 150 million year old fossilized dinosaur bone. This handle is matched to an equally exquisite Japanese made sandwich damascus blade. Each one of these knives is truly unique, and is already an heirloom!